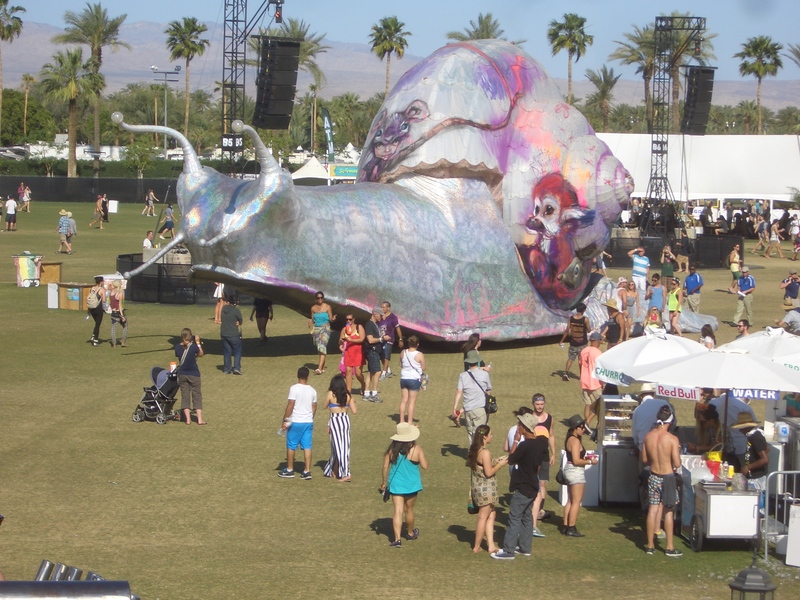 As difficult as finding time to even breathe much less update this site has been this week, I would be remiss if I didn’t share a couple of thoughts about my experience at the Coachella Valley Music & Arts Festival last weekend. For the uninitiated, Coachella has steadily become the most expensive, grandiose, bombastic, and popular music festival in the United States and could one day be that for the world. It has grown in clout each year upon its inception in 1999 (with one key exception being 2000, when it was not held). At this point, the mere mention of the sun-scorched festival at the bizarrely-greened Indio polo club (Ian MacKaye publicly questioned the presence of Palm Trees and grass in the middle of California’s low desert) evokes a series of emotions from even those who’ve never ventured out. My own opinions about the corporate structure of these overblown musical events aside, I decided to cross over to the other side and check what the fuss was about this year. Also, my love of the band Blur outweighs my common sense (the Descendents, too). 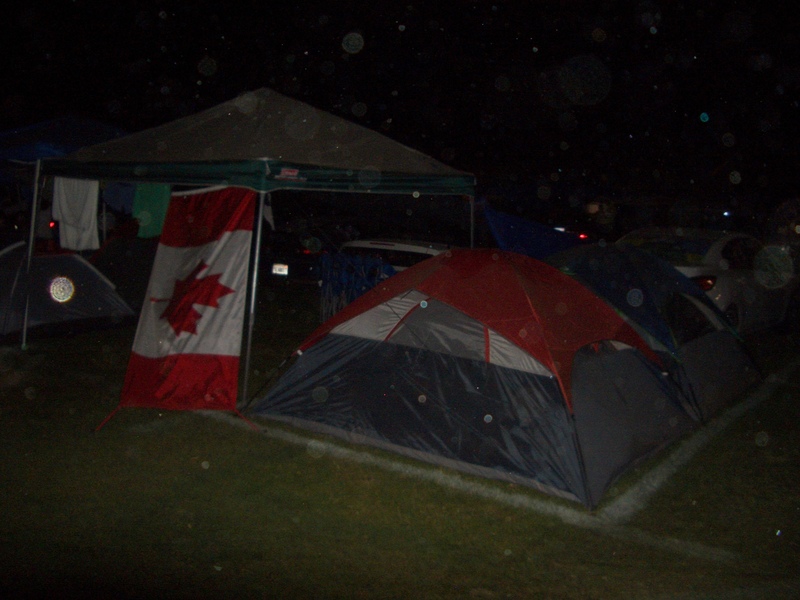 Oh, Canada… Scene at night from the car campground. Given the festival’s international scope, it attracted a great array of visitors from all corners of the globe. All across the campground and sprinkled throughout the crowd, one could find innumerable markers of nation-state (and national) identities. I was too distracted to keep a tally, but I saw a large number of Canadian, Australian, British, Mexican, Taiwanese, Chilean, and other flags. I had great conversations with visitors from cities spread as far away as Calgary, Perth, and Tokyo. Here are a couple examples of other places that found a temporary home in the California wasteland. During Cafe Tacvba’s set on Saturday afternoon, an interesting phenomenon occurred. 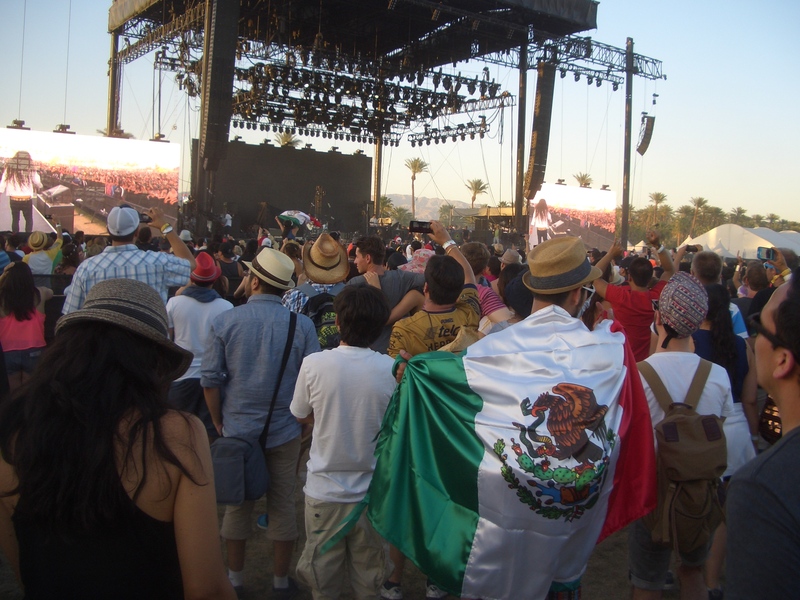 The band’s lyrics and onstage banter (almost entirely in Spanish) coalesced with the fervor of their fans (decorated with Mexican regalia) and the seething desert afternoon heat to simulate the place of a music festival that could have easily stood South of the Border. Of course it helped that many festival goers either spoke Spanish or were visiting from Mexico as well. The crowd to see Cafe Tacvba on the main stage on Saturday afternoon, 4/20. 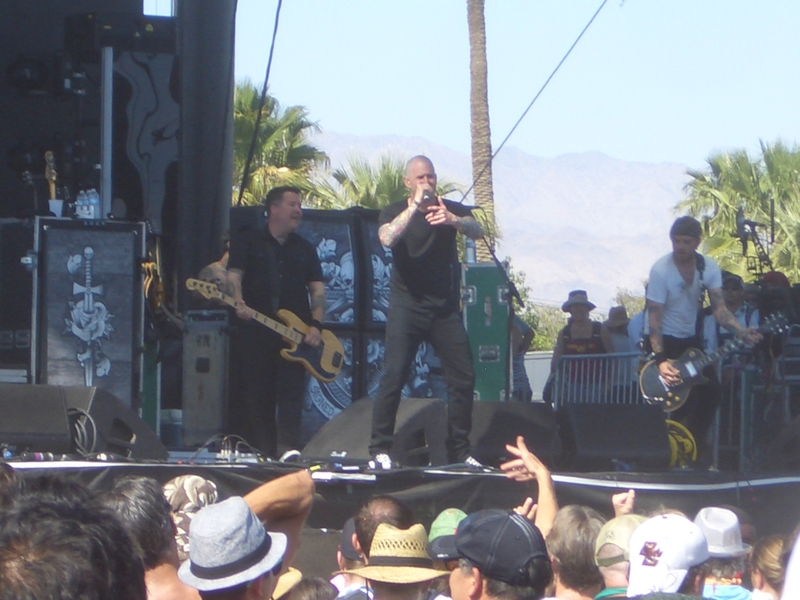 It was also noteworthy seeing Boston represented in the desert via the Dropkick Murphys’ frenetic set. The recent Boston marathon tragedy provided a sympathetic layer to the band’s usual reconstruction of their hometown through skinhead anthems, Irish musical threads (several waving Irish flags were visible, though none of the band’s members have ever been Irish nationals to my knowledge), and blatant name-checking of places in Massachusetts. Hearing these songs in 96 degree low-desert heat felt particularly strange, especially considering how much time I have spent in Boston in my life, but whether or not the crowd members yelling along to “Caught in a Jar” had actually been to Boston felt inconsequential. Few things could better testify to the band’s consistent expression of love for their city (other than perhaps how their first singer, Mike McColgan, left the band to become a firefighter). Unfortunately, that’s all I have time for right now. As much as it would take a lot to subject myself to the experience again, I’m glad that I can now say I went. As much as my head still aches, it was a genuinely enriching experience of sorts. 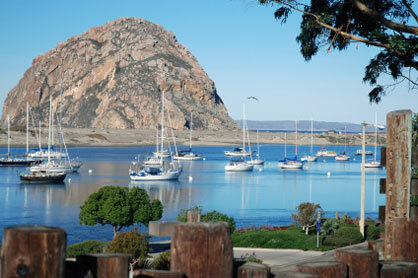 Not that I’m back in conference condition (if there is such a thing), but for those of you interested, my esteemed colleagues and I will be heading up to San Luis Obispo for the 67th annual California Geographers Society meeting. 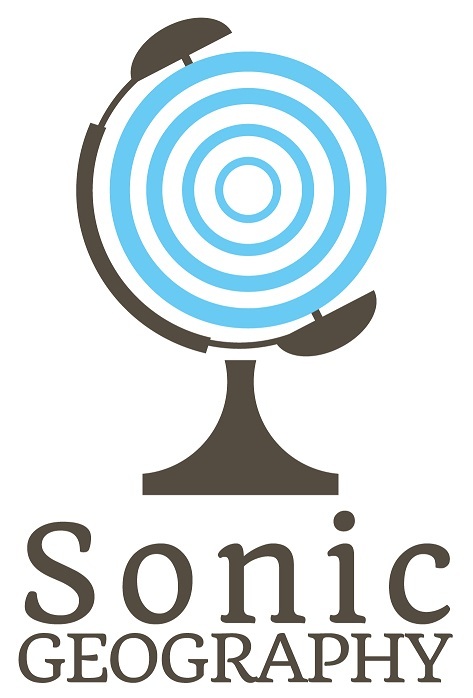 I’m presenting research (on emotional geographies of place in influencing LA record shop development over the past few years) on Saturday at 2:30 in Session 4C – Room 03-201… which I assume will make sense when I actually see the campus. * Apologies to the bands and countries represented who I couldn’t mention due to lack of time and space. The full line-up is listed at their website here.